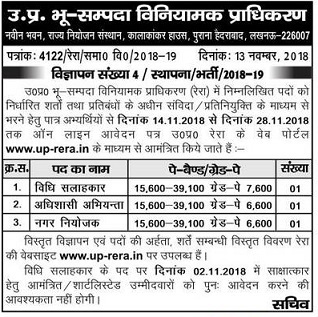 UP RERA Computer Operator Recruitment 2018 Application are invited to fill RERA Vacancy in UP 2018 for filling Graduate Pass Govt jobs in UP. Candidates can apply Online for UP RERA Latest News Recruitment from 28 September 2018 which filled only online. To know more updates of UP Rera Nagar Niyojak or Prashasnik Adhikari kindly check below. UP Rera Latest Recruitment 2018: On 14 November UP Bhu Sampada Niyamak Pradhikaran has given new jobs for UP people to apply as Vidhi Salahkar, Adhishashi Abhiyanta, Nagar Niyojak. Last Date 25 November 2018. Organization: UP Bhu Sampada Viniyamak Pradhikaran. Total Number of Vacancies: 23 posts. Educational Qualification: For UP Bhu Sampada Viniyamak Pradhikaran Recruitment applicants should Graduate Pass, Computer Knowledge and Master Degree according to posts, Diploma certificate are also allowed. Pay Scale: 5200 to 20,200 Grade Pay 2800. Starting Date For Online Application Form: 28 September 2018. Last Date to fill Registration: 12 October 2018. UP RERA Syllabus 2018: From 9 to 14 Columns selection Process done with written exam and interview. Computer operator students will give Skill test on computer typing test after 1 month who qualified in UP Rera Result they allotted respected Bhu Sampada Vibhag UP. How to Apply: Interested and Eligible candidates should apply from 28.09.2018 to 12.10.2018. 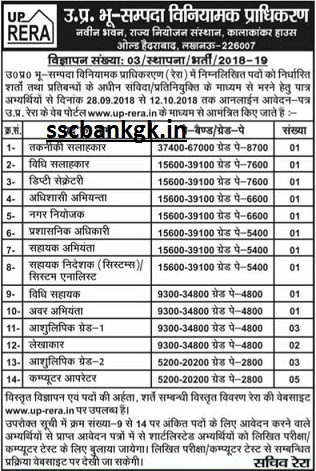 More information UP Bhu Sampada Viniyamak Pradhikaran Recruitment 2018 is given in Newspaper.